A pedestrian bridge at Florida International University in Miami, Florida collapsed on Thursday, killing six people. The bridge was installed in just a few hours using a series of techniques called Accelerated Bridge Construction (ABC). A time-lapse video shows the installation process. It’s unlikely that ABC methods directly led to its collapse. On Thursday, a section of a pedestrian bridge at Florida International University (FIU) in Miami, Florida buckled, resulting in the deaths of six people. The bridge’s section, dubbed a “construction marvel” by FIU, was installed using Accelerated Bridge Construction (ABC) techniques, in which temporary supports helped lift and slide the structure into place. The methods help speed up construction, increase worker and pedestrian safety, and minimize traffic congestion. Most of the section’s pieces were constructed and assembled off-site. 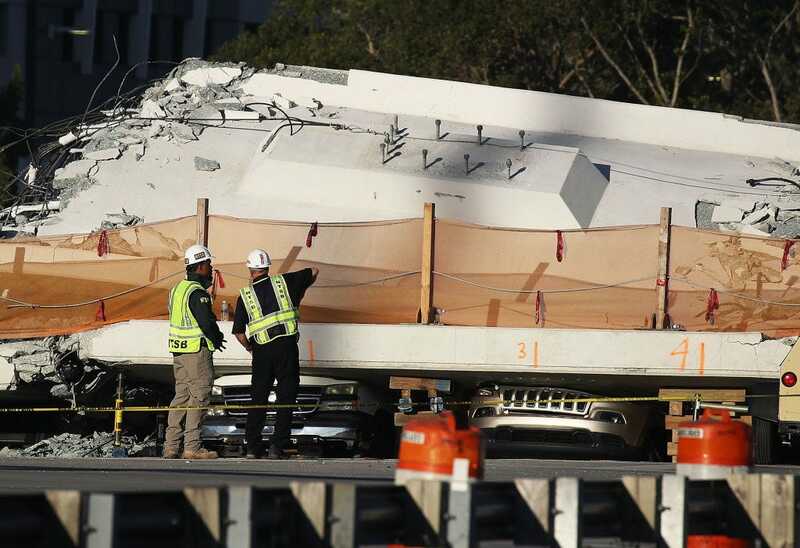 After it arrived on campus on March 10, a crew installed the structure in “just a few hours,” according to a press release from FIU. Measuring 174 feet long and weighing 950 tons, the bridge’s section was the nation’s largest to use ABC methods. Construction of the $14.2 million bridge began in spring 2017 and was expected to end in early 2019. In total, it was supposed to stretch 289 feet long and serve as a study and gathering space. It was also going to be the largest bridge made entirely of self-cleaning concrete in the world. Post-collapse, recovery efforts are still ongoing. It’s still unclear what caused the section to buckle, but the ABC methods are not likely to blame. Plenty of US bridges have gone up safely using the techniques. For example, over the course of a weekend in 2007, the Utah Department of Transportation replaced the 4500 South bridge over the I-215 East Loop in Salt Lake City with ABC strategies without any problems. Another ABC-success story is Boston’s River Street Bridge, which was replaced in a matter of days in 2012. Many of the country’s aging bridges still need work. According to the US Department of Transportation, approximately 25% of bridges need repair or replacement — which means innovative construction techniques that cut down on time, money, and civic disruption are sorely needed. AMG Boss Tobias Moers Isn’t Cornered With Nurburgring Times – Or Is He?